Crystal Reports is designed for presenting database information in the form of reports - visualized lists, summaries, or charts depicting data from tables in a useful RPT format. Reports are drafted in the graphically-orientated Design view, representing form objects like text or shapes as individual objects. This allows information to be arranged into a more familiar format as opposed to reading directly from the datasource. Crystal Reports boasts connectivity with SQL tables, Oracle, Access databases, and Excel spreadsheets. Crystal itself has become partially integrated with Visual Studio over time. Reports can be exported as PDFs or text documents. 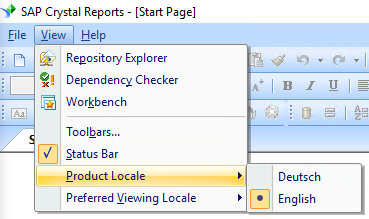 It is possible to switch the language of Crystal Reports user interface. It may be useful to change the language to English before posting screenshots on StackOverflow. This menu shows all language packs that have been selected during initial product install. To add additional language packs modify the installation of Crystal Reports. Open Products and Features , select your Crystal reports installation, then choose Modify . In the installation wizard choose all languages you would like to use. Groups can be added and nested within a report to organize the data in a hierarchy of sorted lists. Outer groups supersede any groups within. This directly affects which records are affected by the Previous keyword. Select the field to group the data by from the top drop-down list. Select the sort direction from the second drop-down list. Mark the Customize Group Name Field (only available in Crystal Reports 8.5) checkbox to show a different value in the group header. SAP Crystal Reports can be installed as a standalone program or integrated into Visual Studio. (SAP Crystal Reports for Visual Studio) - Both of which require very little effort outside of the installation wizard.